As the wood furniture is getting totally out of financial reach of the common people, pallets is getting more and more focused for the all type of wooden furniture goals for any section and area of the house. And here on the DIY platform you would get all types of furniture ideas in order to make your house look a fully functional, fun and decorative space. 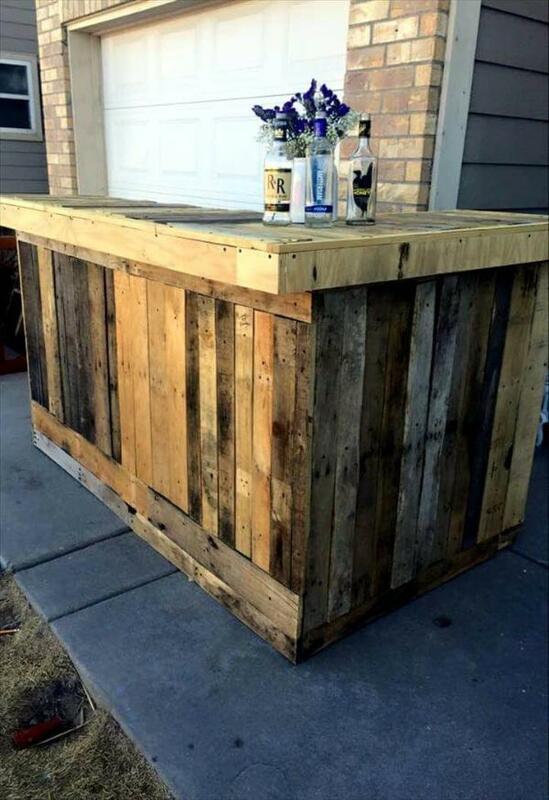 Today we are going to share with you this DIY pallet outdoor bar which would allow you to enjoy the outdoor joy and entertainment with more fun. Being made up from the long and sturdy pallet slats pieces the bar looks durable and a long lasting piece to serve you cold drinks and chilled out beverages for ages. 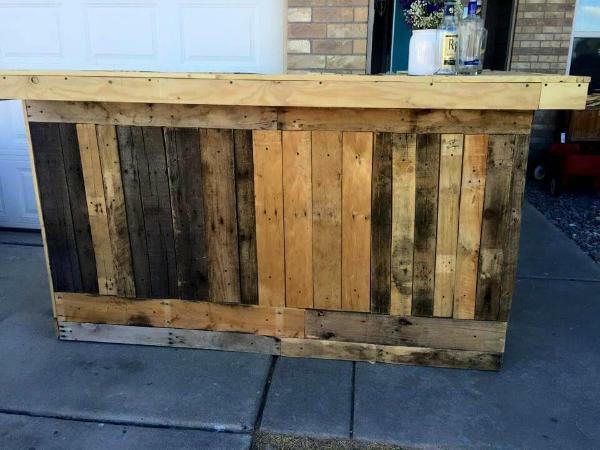 So grab some pallets right now and start building this fun pallet bar in order to elevate the entertainment level of your garden, patio or back yard when you are with friends and family people. Bars have the ability to turn any boring and dull seating area of the house into instant fun as you can enjoy the cold and chilled out drinks along with the friends and family when enjoying some quality time together. 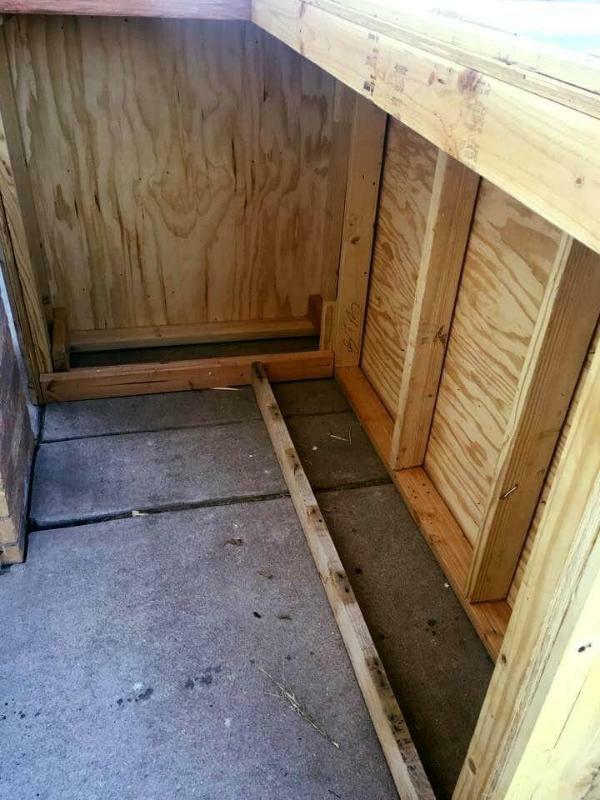 The bar is not a hassle to build from the pallets as you only need to dismantle the pallets into the slat and plank pieces which would be stacked and yoked together using the nails and screws to form this L shape bar for the outdoors. The bar has been kept unfinished here to reveal the rustic look with different shades of the pallet wood surface which is the result of time pallets spent int the junks and landfills bearing the weather wear and tear.